As the oldest athletic organization in the country, the Cincinnati Athletic Club (CAC) has set the standard in athletic and fitness excellence for over 150 years. Since it was first established in 1853 as the Young Men’s Gymnastic Association by local visionaries, the Cincinnati Athletic Club has undergone several transformations and locations. The current building, constructed in 1903 and located at 111 Shillito Place, has become a bedrock of Cincinnati culture and is listed in the National Register of Historic Places. Notable area personalities have been members of the CAC, including U.S. Presidents Hayes, Garfield, Harrison, and Taft with visits by others like George H. W. Bush. The club continues to be home to Cincinnati’s best and brightest business men and women, politicians, educators, and professionals. 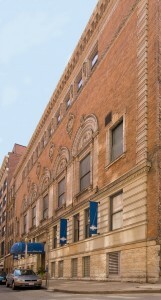 Membership to the CAC is not required to practice yoga at the Cincinnati Athletic Club. You may purchase class passes online or at any Move Your Hyde studio location. The private entrance to the yoga studio is located to the left of the main entrance. Look for the stenciled Move Your Hyde in the window and enter through the door to the left. The studio will be open approximately 10 minutes before each class. Yoga classes are offered daily and you can view the downtown schedule using our online Class Schedule. Where to Park? Several parking lots and garages are within a 1 – 2 block walk to the studio, including the Gramercy Garage (entrance located on 7th street between Elm and Race) and the Sixth & Elm Garage (with entrances both on Sixth and Elm). There are also a limited number of 90 minute and 120 minute parking meters, identified by red 90 and 120 labels. Tip: Push the green button on the parking meter to get your first 10 minutes FREE. 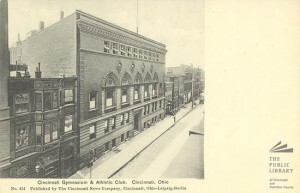 To learn more about the Cincinnati Athletic Club, please visit www.cac1853.com.